There is something exposing about hotel rooms. The blandness of their shop-bought neatness erodes individual identity, and deprives humans of the material and emotional domestic crutches that keep them on the straight and narrow. They are the perfect place to go misbehave and go mad. Rose Lewenstein contains all the action of her pacy 70-minute play Cougar in one hotel room, or rather a series of hotel rooms, spanning the globe. Across 80 impressionistic non-linear scenes we see her characters, John and Leila, descend into darkness in this room, turning semi-feral as the world outside creeps towards climate-change catastrophe. The single setting adds a believably claustrophobic atmosphere to a play that deals smartly with big themes, but lets them subtly play out through a close-up relationship drama rather than hammering them home. There’s a lovely irony to Lewenstein’s writing, too. Leila, a big-earning 40-something expert on corporate climate policy believes she deals with the “big picture” stuff that could change – save – the world. But she’s shockingly ambivalent about the small picture stuff. She wants, gets and consumes without conscience. And this includes her relationship with young bartender, John, whom she’s picked up at a hotel and flies around the world as a kept man to keep her company in endless fancy but faceless rooms. Leila wears a new version of the same dress every day, ripped from plastic, as she discards a perfectly good one. She buys John a new outfit, too. It’s an identikit version of what he’s already wearing but with designer tags this time, and costing exponentially more. Outside their room(s), the weather becomes ever more unpredictable. Inside, the pair becomes increasingly cruel and uncaring. 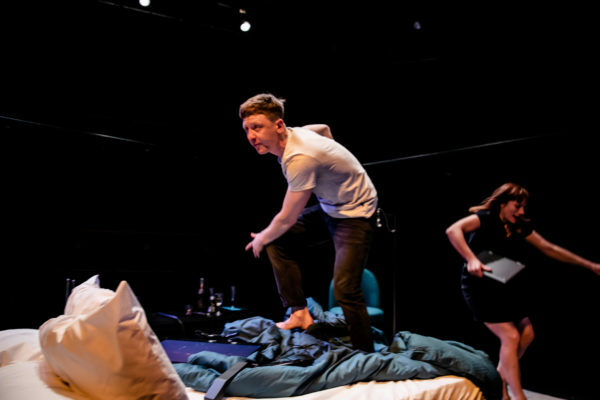 Leila’s position is turned on its head, in a play that questions how our attitude towards the small stuff affects the big stuff through this odd and possibly abusive relationship. Cougar presents scene after scene where capitalism – or the abstract concept of money – intersects with human nature, morality and the environment, to question how we can navigate a system that wants to reduce everything to a transaction. The themes pile up as the pace becomes more urgent and Leila and Jack’s relationship becomes more fraught, but Cougar cleverly resists pointing towards answers. Leila’s salary grows, but the problems she purports to want to solve remain unanswered. Rosanna Vize’s well-pitched hotel room set, which comes with a box frame that almost overwhelms the stage, heightens the feeling of claustrophobia and plays perfectly as generic, high-end corporate design. Chelsea Walker’s sharp and taut direction makes much of the enclosed space. Actors Mike Noble and Charlotte Randle stalk each other around the bed. As emotions become frayed, they become more frenetic, leaping on beds, moving furniture and generally trashing the space in a way that mirrors their destructive emotional states – a quiet comment on the careless “big picture” destruction of the environment. Lewenstein’s characters feel fully fleshed out and both performers effortlessly find a range of emotion that makes them believably complex. Charlotte Randle’s sleek but emotionally impenetrable Leila is played with almost forensic attention to detail, while Mike Noble’s John is compelling as he transforms from happy-go-lucky lad to deranged, emotionally needy lover. Satisfyingly, Cougar presents a woman who’s an emotionally detached, status-loving suit as an uncommented on fact. The play is a powerful dissection of how we live today that raises many questions about individual responsibility in an increasingly complex world. Cougar is on at the Orange Tree Theatre till 2nd March. More info here.